The Girl with the Dragon Tattoo is a Swedish thriller, based upon the novel of the same name by Stieg Larsson. The film centres on our two main protagonists, with the first being Mikael Blomkvist (Michael Nyqvist), a investigative journalist who writes for the magazine Millenniun. At the beginning of the film, Blomkvist loses a libel case against a corrupt Swedish industrialist and is sentenced to 3 months in jail, with 6 months before he has to serve his sentence. Our second, and most interesting lead is Lisbeth Salander (Noomi Rapace). A 24-year-old hacker, who is angry, troubled, but equally as brilliant, has Blomkvist under surveillance for one of her clients, following him and hacking his laptop, tracking his work on the case. Salander believes that Blomkvist was setup and continues to monitor him by hacking his laptop, after the trial has ended. Later, Blomkvist is invited to meet Henrik Vanger (Sven-Burtill Taube), an industrialist, who wants Blomkvist to investigate the disappearance of his niece, Harriet, who went missing more than 40 years earlier. Vanger believes that she was murdered and it was the doing of one of his relatives, as they were having a family reunion at the time of her disappearance. Blomkvist accepts and later he is joined by Lisbeth and together they set to unravel a mystery that has gone unsolved for 40 years. The Girl with the Dragon Tattoo is already a worldwide phenomenon, with the Millennium trilogy of books being written hits and now the film adaptation of the first book already being a critical and box office hit around the world, with two sequels following closely behind. Now personally, I’ve never read any of the books and knew little about their subject matter, so I went into this film with an open mind, not knowing what to expect and I gotta tell you, this film blew me away! From the story, to the characters, performances and the look of the film, it’s film making of the highest calibre. All these elements come together to create a film experience that is getting harder to find nowadays. An intriguing story that centres around a rip-cracker of an old school mystery, with interesting and compelling characters, that I actually want to sit and watch. Michael Nyqvist as Mikael Blomkvist takes centre stage in the first part of this Millennium trilogy. I found him to be very believable in this film. Not hearing of him before or seeing him in another film, Nyqvist plays the part to a high degree, being a fearless investigative reporter, he gives us a performance that is very watchable, with our eyes glued to the screen during his quiet, non-speaking scenes. Though the real gem of this film and the universal factor that everyone who sees the film agrees on is Noomi Rapace as Lisbeth Salander. If there is only one reason to watch this film (though there are a many great reasons to watch this film), it’s for her amazing performance. Seriously, I cannot go on enough about how amazing and arresting her performance is. Salander is a darker, damaged character, decked out in black leather, punk t-shirts, thick black makeup, chains, tattoos and ear and nose piercing. Salander is a complex character. One that is credibly crazy, who’s almost like a super heroine, with her skill set. She’s an incredibly resourceful woman, who solves the one clue that gets the ball rolling to solving the 40 year old mystery that the film revolves around. We gets glimpses into her past, with elements that will no doubt be explored further in the next two films, which is another reason why I want to line up for the next film. We follow Lisbeth through the film at first as the victim (in the films most difficult scene to watch), to eventually becoming the hero, that saves the male lead from a grisly end, which is a fine reversal to the standard film staple of the male saving the damsel in distress. The original Swedish title of the book/film is “Män som hatar kvinnor” – which translates as “Men Who Hate Women” and it’s a theme which keeps recurring in the film that ties the majority of these events together. The film does feature some darker themes, which do make the film uncomfortable and hard to watch in some areas, mainly regarding Lisbeth and her new probationary guardian - Bjurman (Peter Andersson), who turns out to be a sexual sadist. The scenes between he and Lisbeth are full of building dread and it cultivates into the films most difficult scene to watch, but they are for the sake of story, are ended quickly and aren’t glorified. The only gripes that I do have with this film, is that it takes so long for the two leads to get together and the investigation to get into full swing. They don’t actually meet until almost half way through the film, but once they do, the film shifts into top gear and we’re taken along for the incredible ride. Also, it never affected me, but the films running time may detract for some viewers and they might get a bit squirmy having to sit for almost 2 and a half hours, but in the end, it is well worth it. This film, being the critical and box office hit that it has been, it’s no wonder that Hollywood has taken an interest in the films two leads, with news that Mikael Nyqvist is in final talks to play the lead villain in Mission: Impossible IV and Noomi Rapace having meetings with major Hollywood directors, including Ridley Scott and she has been cast in her first English speaking role as the female lead in Guy Ritchie’s Sherlock Holmes 2, alongside Robert Downey Jr. and Jude Law. Hollywood has also dived in with the American version of The Girl with the Dragon Tattoo to be directed by David Fincher, which is fitting, due to the films subject matter. It’s right up Fincher’s alley ala Se7en and Zodiac. 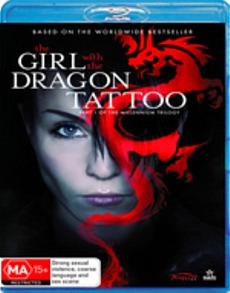 The American version is to star Daniel Craig as Mikael Blomkvist and Rooney Mara as Lisbeth Salander. The film will also co star; Robin Wright, Stellan Skarsgård and Christopher Plummer. Being a fan of David Fincher, I’m excited to see how the English version will turn out. I’m confident that it will be interesting, especially with all that are involved and Fincher’s reputation to having his films done his way, without studio interference. The extras included on this disc are half decent, but nothing to write home about, with the films UK trailer, Swedish trailer, music featurette, image gallery, but the best of these extras are the trailers for the films two sequels - The Girl who played with Fire and The Girl who kicked the Hornets Nest, which is big plus for those of us excited to see the further adventures of Salander and Blomkvist, but the disc is worth the purchase price alone just to see this great film in all its HD glory. The one thing that binds the film together and makes it worth watching in the first place is that it’s has a great story, which, in this films case is the mystery! The disappearance of Harriet Vanger in 1965. Whoever thought that sitting and watching scenes of characters sitting silently, staring at piles of newspaper clippings and old photographs, trying to find clues could be so downright irresistible to watch! The Girl with the Dragon Tattoo is an edge of your seat thriller, that deserves a watching. These films and books are loved the world over, so don’t you think you should jump aboard and see what all the fuss is about?